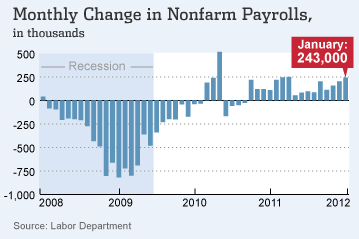 A chart speaks a thousand words so the below chart of the monthly nonfarm payrolls over the last four years speak to the recent strength in the report. We'll let the experts spin all the minute details of the report, but this charts shows how the US economy is on the verge of a major breakout. Employees flush with cash just can't hold back any longer. The biggest concern is that this provides Obama with the ammunition that he needs fore re-election. That could subdue any Spring rally. I think in cases like this, they should devise a way to find complete payroll solutions for these workers. It's important to always look for solutions instead of ranting.